Mike Fallat prepares for the ultimate keg party. July 3rd found us all heading into three different directions. The families headed for the Marine World Amusement park. The rollercoasters and animal attractions were big hits. The fireworks at night were an added bonus. The groups of folks wearing the reunion caps made us very recognizable. A security guard asked me what we were doing with the same caps. After explaining the reunion to him, he told me he was a Marine in his younger days. He wasn't very impressed when I told him the best Marine was a Submarine. We got a good laugh out of it. The over 21 crowd made the trip into wine country. A trip headed by Martha McGettigan, General Vallejo's great great granddaughter. We were able to fill two busses and cruise into Sonoma. The first stop was the Sonoma Barracks where Gen. Vallejo made his stand against the Russians all those years ago. The decommissioning crew made a stop there in 94. You can read about that in the Final Voyage of the 658. Coffee and doughnuts were served with a helping of the days events so everyone would know what was in store. 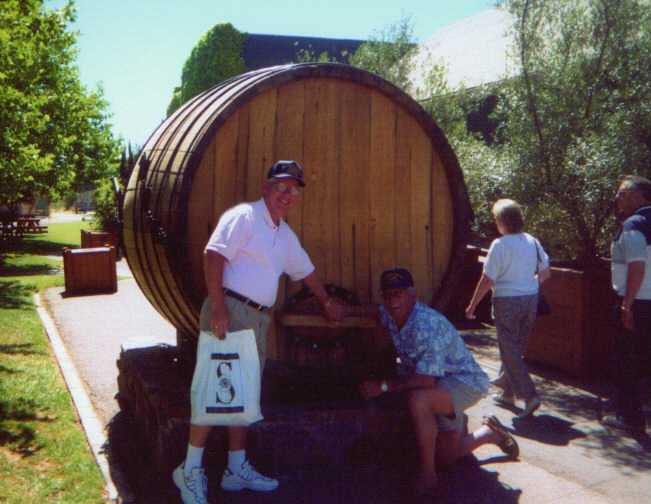 The next stop was a tour of the Sebastiani Winery in downtown Sonoma. An excellent tour of the facility provided tips on the wine making process and hands on tasting of their products. The tours were conducted in 2 groups to allow each group time to browse the shops of the Sonoma Town Square. The tasting room and the gift shop were busy for most of the morning. I received a letter from the folks at Sebastiani telling me what a fantastic crowd we had there. After Sebastiani the two groups arrived at the General's house, which is ran by the California State Parks Commission. General Vallejo's birthday is July 4th. What a surprise to find the General there when our groups walked onto the grounds. Actors in full costume of the era put on a show for us, celebrating the General's birthday. A harp player strummed Happy Birthday while we all serenaded him. His family gave him gifts and then we stepped in and presented him with an All Hands Reunion 99 cap and made him an honorary member of the crew. Then the tables turned and Martha Mcgettigan presented my wife and I with a beautiful picnic backpack from herself and the Reunion Committee. It was a fun time indeed. Lunch was served as was cake and refreshments. The General's birthday party over, we then loaded up the busses and headed north to Glen Ellen Vineyard. Glen Ellen makes the M.G. Vallejo line of wines. They were thrilled at the prospect of having us visit. The staff of Glen Ellen donated the wines for the banquet and 2 magnums for door prizes. After the tour and tasting the gift shop announced that the members of our tour could have an additional 40% off everything. I am told business picked up quickly. I met Bus One at the Holiday Inn around 5 that afternoon. The gang looked like they had a full day and everyone said they had a great time. I noticed some wine packages destined for home collections and I even got a hat and shirt from my wife. The Golfers went to the Bluerock Springs course early in the morning. Rick Kazar, event coordinator, met me there at 6:45 am. No easy task for us after the late night at the banquet. We issued the commemorative golf towels and Rick got the golfers off to the tees. The tournament did not get the turnout we had hoped for but the fellows all had a goodtime. Some of the guys played another round after the tournament. I never did get quite clear on who actually won. The Rob Thornton/Bill Stark grudge match captivated my attention. I think Bill may have got by on a stroke. Follow the links below to view some photos from the days events. The guys and their families made this entire reunion what it was, a splendid time. I enjoyed so much meeting everyone though I wish I could have spent more time with them. Enjoy the photos and I hope to meet you at the next reunion.